On the weekend of August 8th and 9th, tourists and art enthusiasts meandered through 15 scenic miles for the ART Drive, where 32 Dartmouth and Westport, Massachusetts artists welcomed them for the eighth open studio weekend and raised a record of almost $5,500 for the Lloyd Center for the Environment. 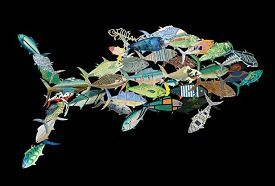 Each year, the participating artists apply their creativity and style to create large, colorful depictions of popular species of fish. For 2015, the artists chose the bonito. Their four-foot long “Bodacious Bonitos” were available for previewing in public spaces and in front of local shops, businesses and other sites in Dartmouth and Westport prior to the ART Drive weekend. People were able to view and bid on the fish on eBay with a portion of the proceeds from those sales benefitting the Lloyd Center. The Lloyd Center for the Environment is a non-profit organization that provides educational programs on aquatic environments and supports scenic, public walking trails through 82 acres of estuaries and salt marshes in South Dartmouth, MA. Artists opening their unique studios each year include the area’s premier painters, ceramic artists, photographers, jewelers and woodworkers. This year’s ART Drive Artists: Sandy Hall, Beverly Carter, Michael Hubert, Deb Ehrens, Sarah Daughn, Maddy Bragar, Dora Millikin, Susan Strauss, Frank McCoy, Wendy Goldsmith, Gay Gilles, Peggy Call-Conely, Jimmy Viera, Barbara McDowell, JP Powel, Paula Kochanek, Marty Keating, Kirt Rebello, Ellen Langer, Debra Valeri, Marjorie Puryear, Stephen Remick, Anne Carrozza Remick, Joney Swift, Jill Law, William Kendall, Morgan Bozart, and Sue Wadoski. Emerging Artists: Caitlyn Kenney, Emily Rath, Marcus Cusick and Jake Ginga. The ART Drive also featured a group of high school and college students as part of the ART Drive’s “Rising Stars” exhibit. The Rising Stars exhibit provides the opportunity for local students to display and sell their work to an audience of art lovers and collectors. One of the Emerging Artists, Marcus Cusick, leveraged his high school technical background with his art background from college to create works of art from found objects. “They are from back yards, old houses, machine shops and junkyards,” he said. Mr. Cusick demonstrated wall sconces that were “put together based on composition and design with added functionality.” Other student artists used internal motivations such as curiosity or challenges they have faced as the focus of their works. The ART Drive is the region’s only juried, open studio event. It is exclusive to Dartmouth and Westport participant artists and artisans who work primarily from their home studios. The 2016 ART Drive is scheduled for August 6 and 7, 2016.